During one of the busiest times of the academic year, the students we interviewed were mainly using different IT devices to stay in touch with their friends while they were in the campus library. In the hour before we interviewed them, 81% of the students in our sample had checked for new messages (e.g., email, Facebook, IMs, texts). At the same time, many of the same respondents who said they had checked for messages had also prepared assignments for submission (60%), studied and reviewed materials for class (52%), and satisfied personal curiosity with a computer search (e.g., sports score, news, gossip) (45%). Despite the pressing need to complete assignments at crunch time, few respondents reported having used the full range of library resources and/or services during the previous hour. Many more respondents said they had used library equipment (39%) such as computers and printers than anything else, including scholarly research databases (11%), library books (9%), face-to-face reference (5%), and/or online reference (2%). Overall, we found most respondents (85%) could be classified as “light” technology users. These were students who used “only” one or two IT devices primarily in support of coursework and, to a lesser extent, communication. The most frequent combination (40%) of devices being used was a cell phone (including smart phones) with a personally owned laptop computer while they were in the library. In stark contrast, only 6% of the sample could be classified as “heavy” technology users. For over half the sample, a personally owned laptop (58%) was the primary—most essential—device in use at the time of the interview. A smaller percentage of respondents (35%) were using a library desktop computer. More than any other combination of applications, respondents had both a Web browser and a word processing program open at the same time (47%) while they were in the library. Despite the vast universe of information available on the Web, the majority of respondents (61%) only had one or two Web sites open at the time of the interviews. 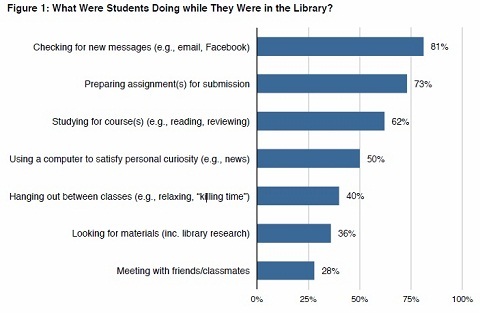 Moreover, all of the respondents had created some type of highly individualized information spaces for use in the library (i.e., the Web sites and applications each student uses to study, research, communicate, and play). There was little overlap in the Web sites that were being used from one student to the next, although more respondents had Facebook (13%), a personal email account (e.g., Gmail) (11%), and/or a learning management system (e.g., Moodle) (9%) open when interviewed. Two-thirds of the sample (65%) said they had some experience using social media sites, such as Facebook, online forums, Twitter, or YouTube, while engaged in the current termʼs coursework. For example, students in post-interview discussions described using Facebook to coordinate meetings with fellow classmates. To a lesser extent, a small set of self-starter students described using social media sites, such as Facebook, online forums, and YouTube to create new studying and learning practices. In these cases, sites were used out of intellectual curiosity and/or to excel in courses or grasp course material they did not fully understand. This entry was posted in 資訊素養 by ted. Bookmark the permalink.